What to do on a hot day in September? Show up! It was hot!! Above 95 degrees most of the day. 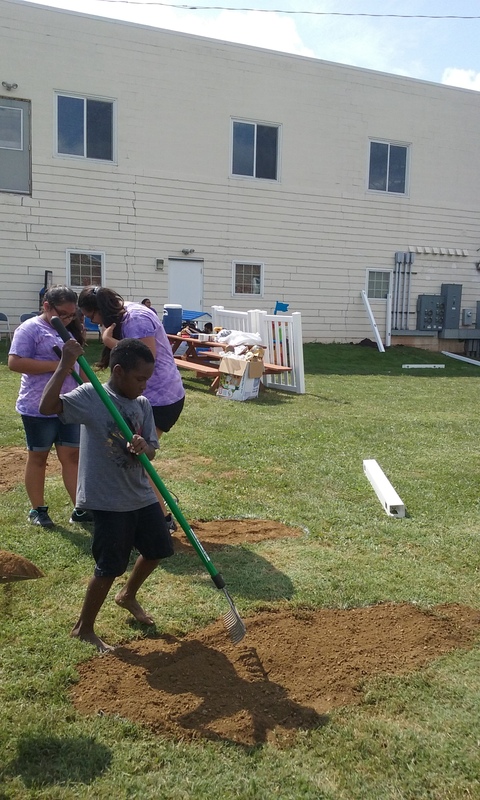 That did not stop over 35 volunteers from coming for at least part of the day to build a fence to make a safe place to play for kids at the SCCAP facilities in town. 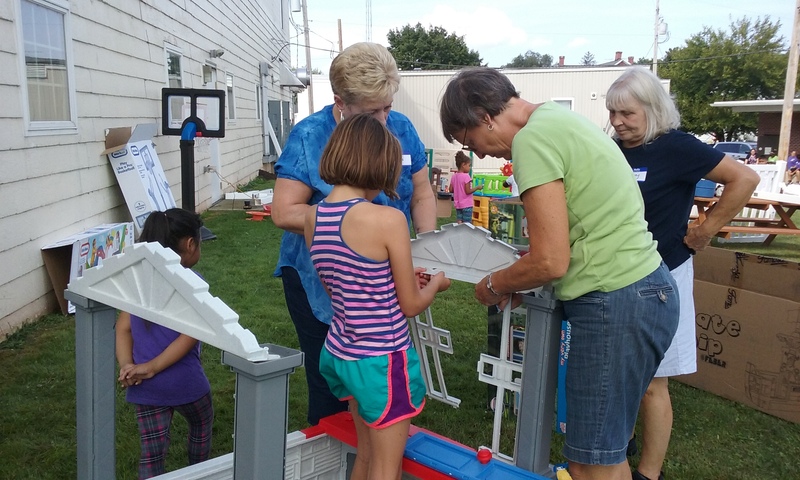 The South Central Community Action Programs of Gettysburg had a need. 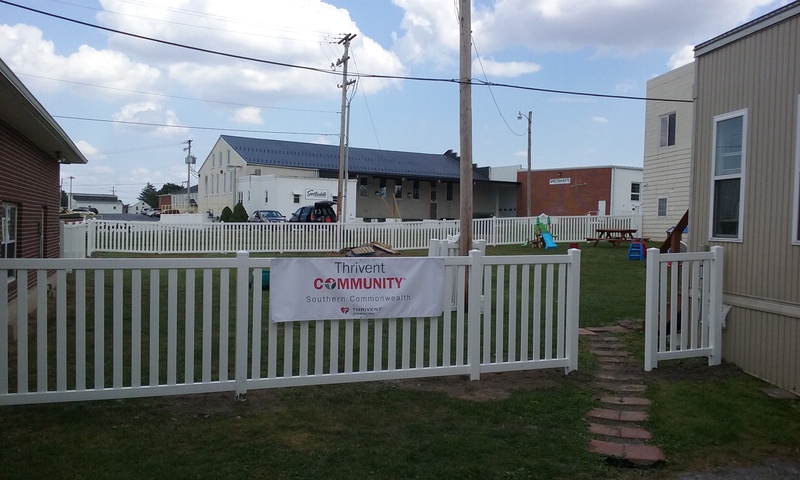 Thrivent members and friends answered that need by showing up with some sweat equity and built that fence. 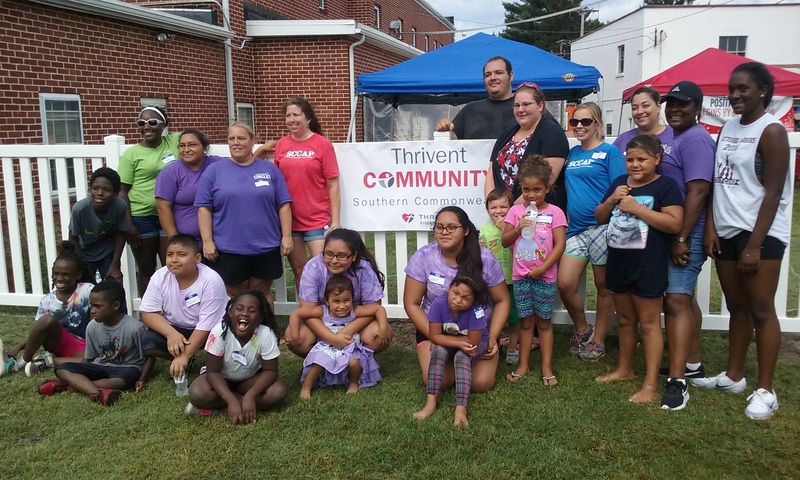 It was all organized by the Thrivent Community – Southern Commonwealth. 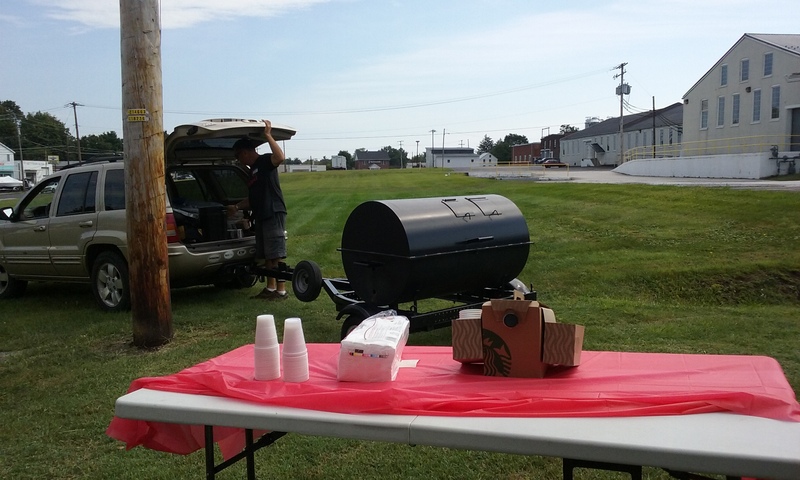 Volunteers started to arrive about 9 AM. 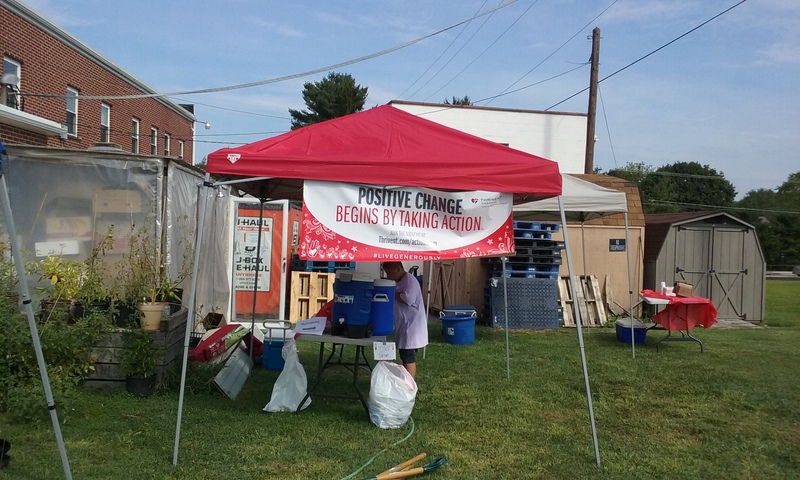 Shade tents were set up and plenty of ice and water were on hand. 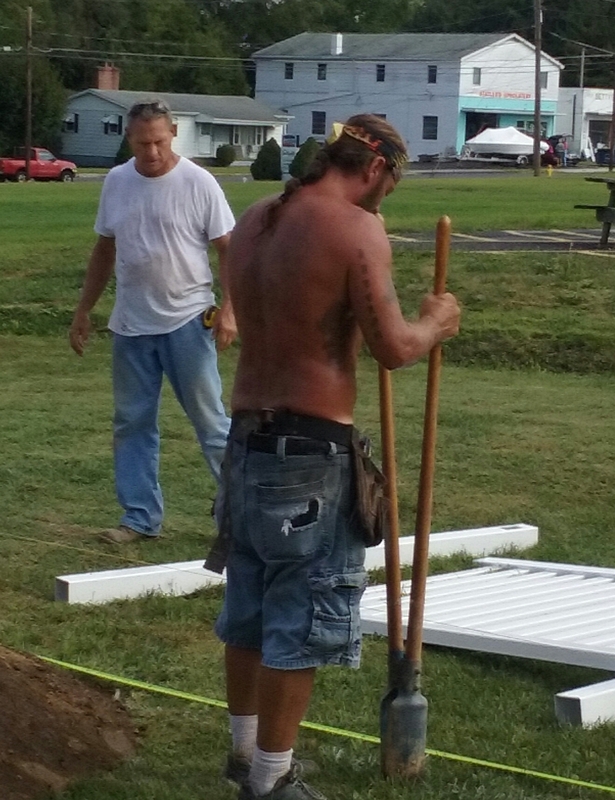 Men were digging post holes and carrying fencing. At first there were a lot of guys who were getting organized and doing a good job figuring out how to go about the process of getting the fence up. It was getting hotter faster and progress seemed slow. Then out of the blue a stranger to most of the volunteers appeared on the scene and calmly announced that he has been in this business for 18 years. Suddenly we could see the light at the end of this hot tunnel! 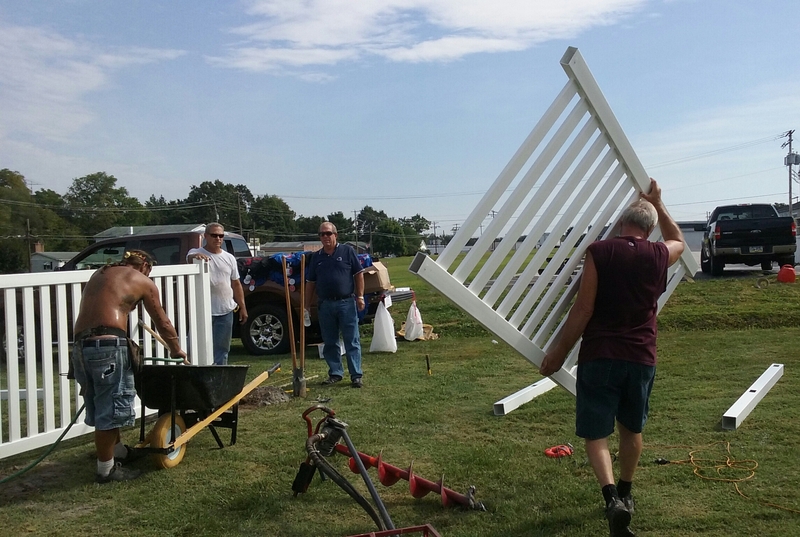 The fence began to take shape in a hurry. The men worked together so well with the help of this professional. When asked how we were blessed with his presence he replied, “I saw it in the newspaper and thought I could help.” Help he did, and everyone appreciated his expertise so much as we watched this miracle take shape. 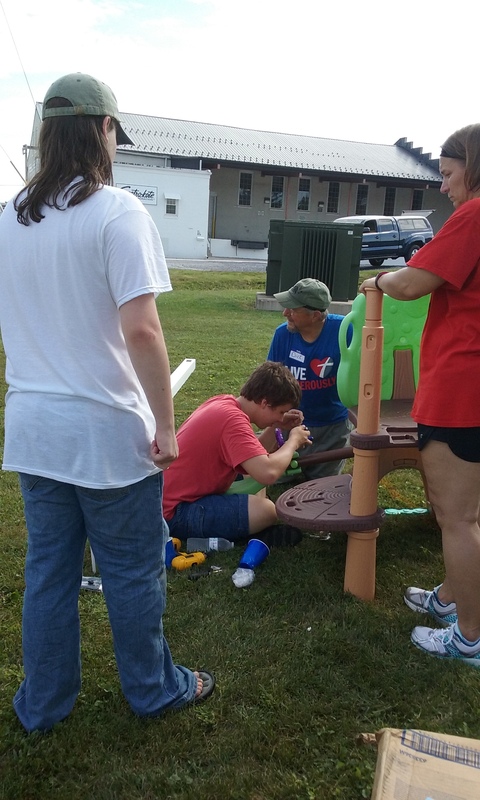 Meanwhile back in the shaded area, others were busy assembling play ground fixtures. Some of them came together quite simply, others felt like a frustrating Christmas Eve dilemma. As soon as the toys came “off the press” so to speak, they were put to good use. 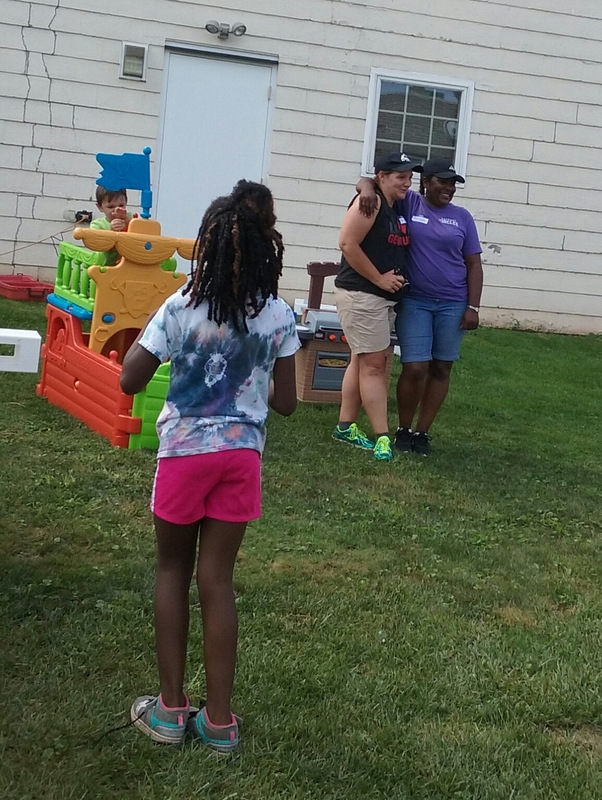 Gina, on the left, a Thrivent representative and Tanya on the right, representing SCCAP, share a mutual admiration hug, as they both worked very hard to see this day to its completion. 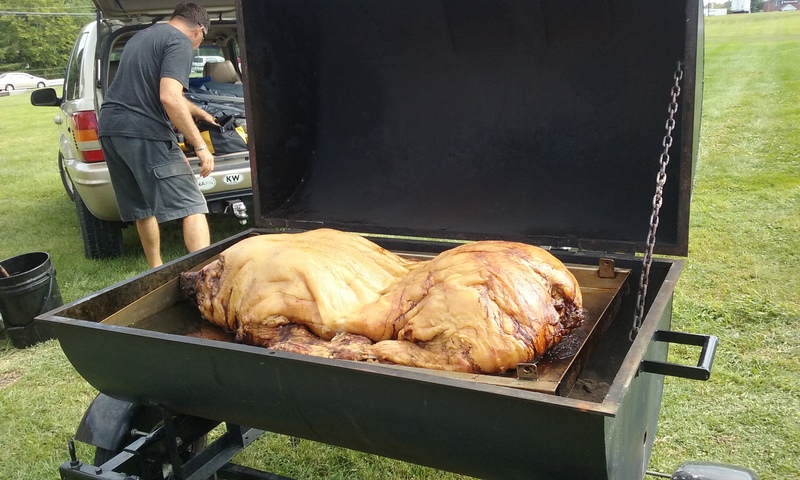 “The pig” rolled in just after 11. He was well done. This is what is known as a “Pennsylvania Pig Roast” as opposed to the “Hawaiian Luau.” One of the kids standing by when the hood was open said quite flatly, “Who killed the pig?” Adding emphatically, “I don’t eat pig!” After a second thought she said, “Oh except for bacon and ham.” When the piles of meat ended up on the platter, she ate “pig” as well. As lunch time drew near the end of the job seemed closer and even the kids joined in to help with the work load. 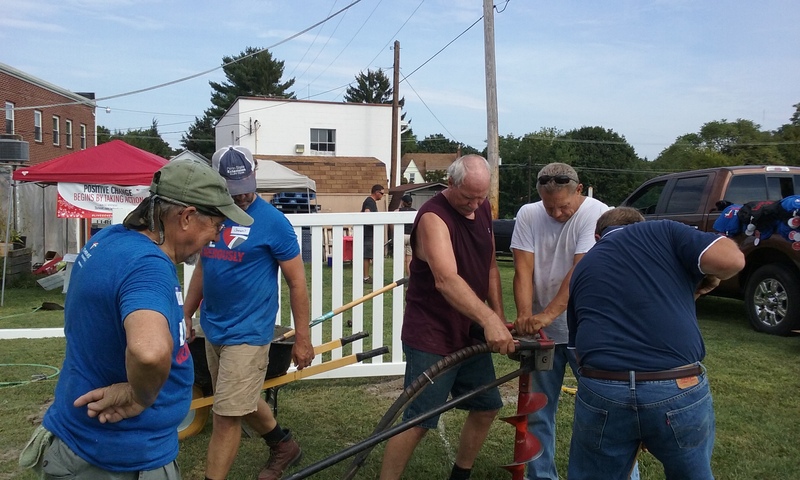 Others were having fun, and the men, kept digging post holes. Soon enough the fence was completed and the pictures proved a job well done. The end product did seem a miracle given the heat of the day and the surprise show up from an unexpected angel. 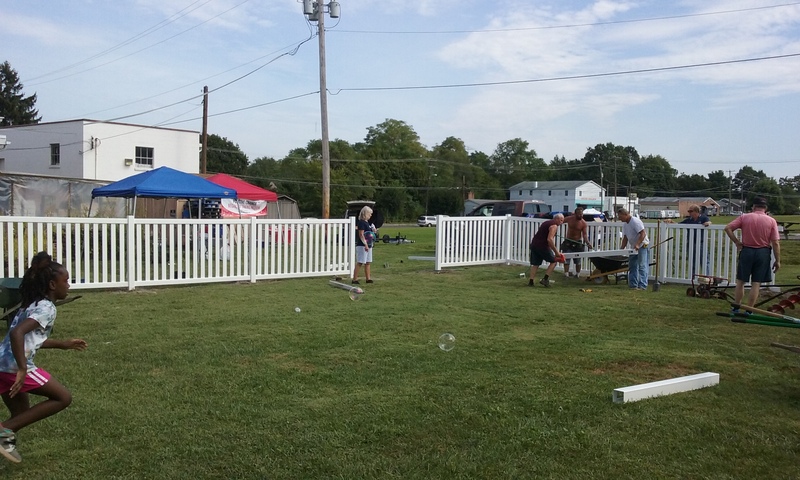 I love it when a plan comes together and how just “showing up” for a community project can bless so many people. History is a favorite of mine, so whenever I get a chance to “walk back in time” I am inclined to take it. 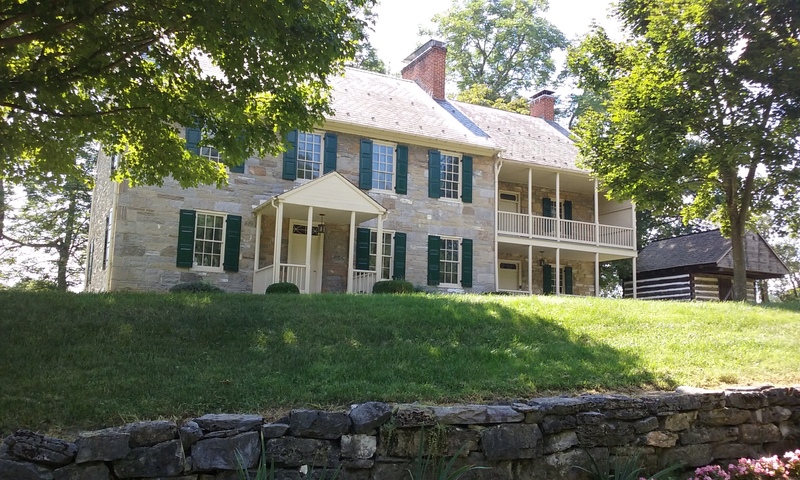 This summer my friend took me to Renfrew Museum and Park located east of Waynesboro, PA right along route 16. The name Renfrew came to the park from a tragic story of American History. The Renfrew family lived on the land now known as the park until their two daughters were were killed by Indian Warriors in 1764. 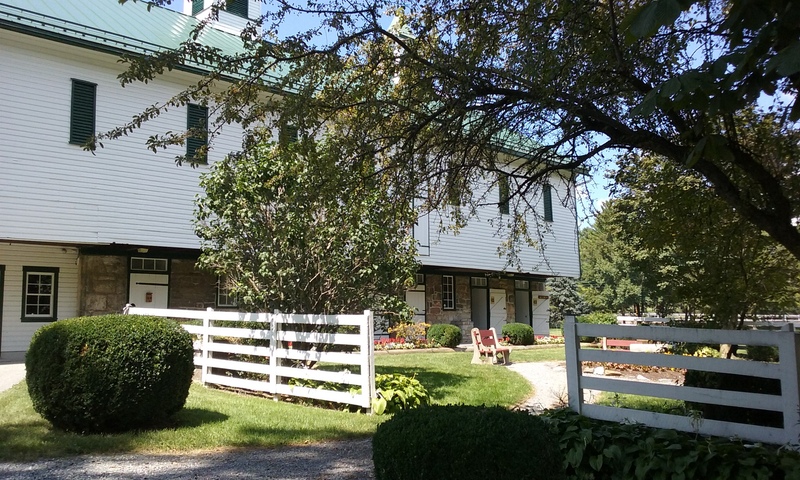 Later the land was owned by the Daniel Royer family who built an operated a tannery, a gristmill and a lime kiln, soon developing a self sustaining farmstead. The mill was built by the Antietam Creek. Today that same creek offers this quaint bridge and cool, clear flowing water. Years later Royer constructed the present stone house, that is now the museum, moving his large family from their 23 by 23 square foot log cabin. 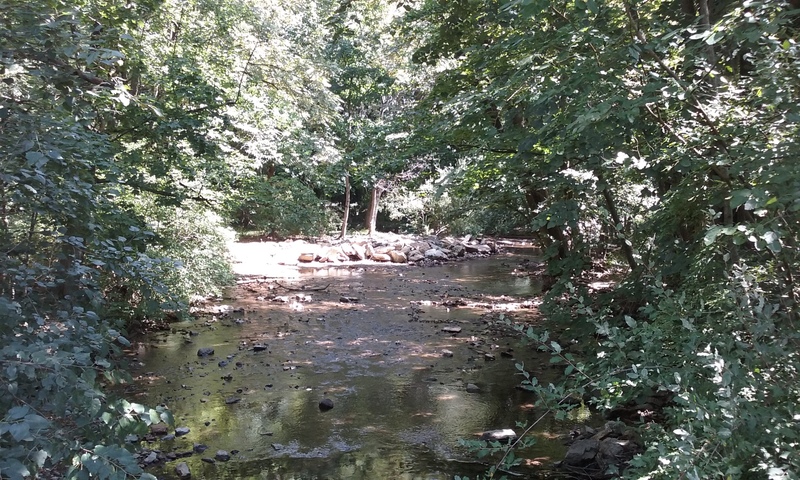 Two centuries later 107 acres of the land was donated to the town of Waynsboro through the generosity of two sisters who were the last owners. Rather than naming it for themselves, they wanted to honor the first two sisters who lost their lives on the land. Therefore the name Renfrew Park. 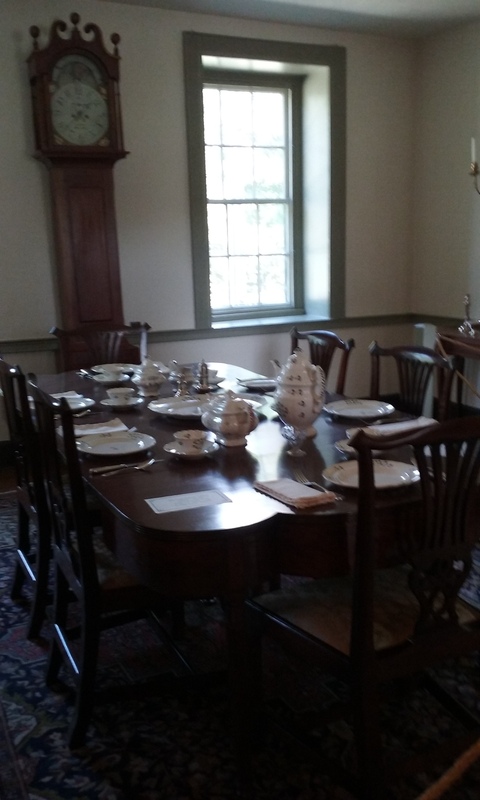 A look into the museum house along with an informed guide is truly a step back in time, and gives much insight to 19th century Pennsylvania German farm life. 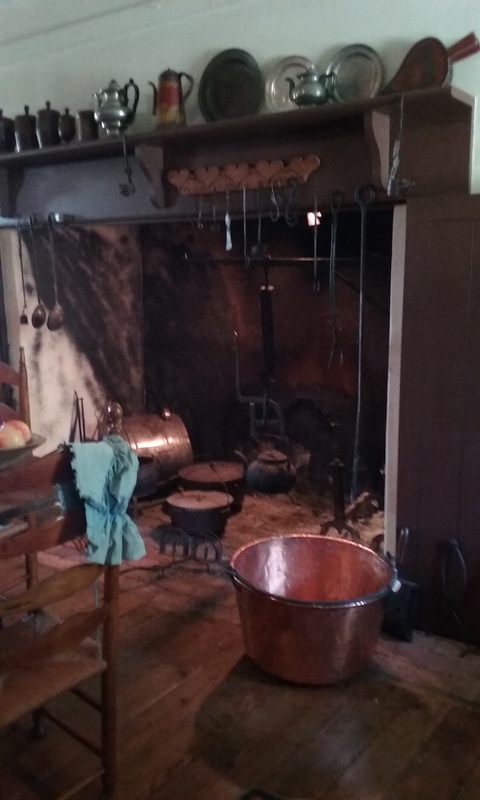 As I stepped into the old kitchen, the first thing I noticed was the shiny copper kettle sitting by an ancient looking fireplace which was of course, the center of the meal preparations in that day. Our family owns a copper kettle much like this one, that is dated to pre civil war days, was given to my grandparents and handed down through the family. It is carefully cleaned and stored each year after we cook about 82 quarts of apple butter in it for several hours in October. This has been a long standing family tradition. The china, silver and pottery displayed throughout the house marks the beauty of that century. The style of the German house also reminded me of the old Pennsylvania farm house where I lived in Lebanon County. That house was laid out in much the same fashion. There was a hallway and a staircase separating the main portion of the house with two rooms on the other side. The bathroom was located in the same place and was an entire room as large as the other rooms, probably bathroom fixtures were put into a former bedroom after indoor facilities came into play. 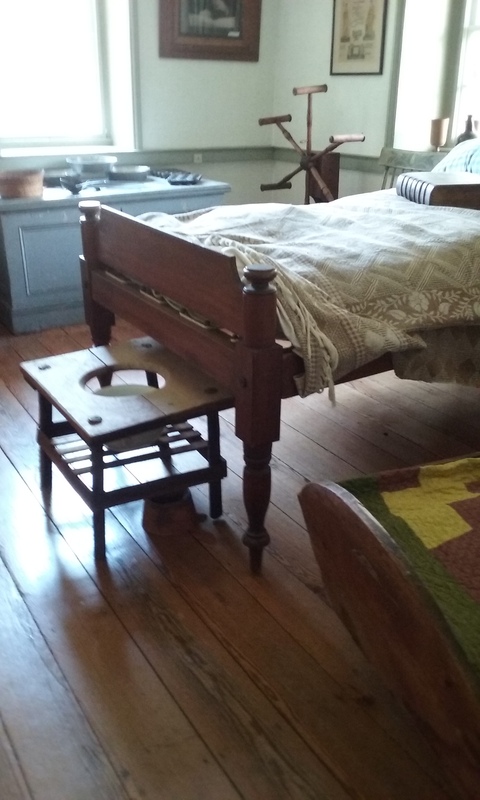 The bedrooms included different styles of beds and chamber pots. I thought this one was innovative. 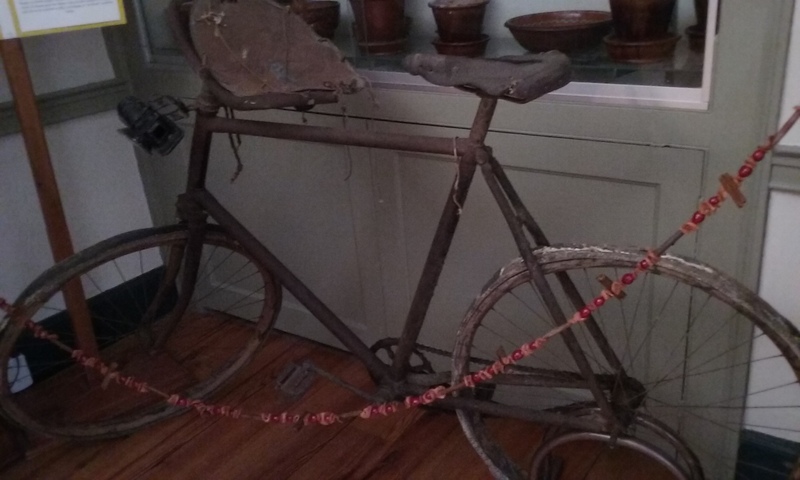 This old bicycle has an interesting story. One of the donating sisters, who lived next door at the time, recalls taking rides with the farm owners on this bike. She remembered sitting on a seat of some sort attached to the handle bars. As she rode, thinking of the kindness of her neighbor and the beauty surrounding her, she dreamed of living on the farm one day. A dream which eventually came true. The seat was found years later in the barn. The lovely barn setting today houses space for local artists, and souvenirs, including a set of 3 books written in “Little House on the Prairie” style, telling the stories of the people who have loved this land for centuries. 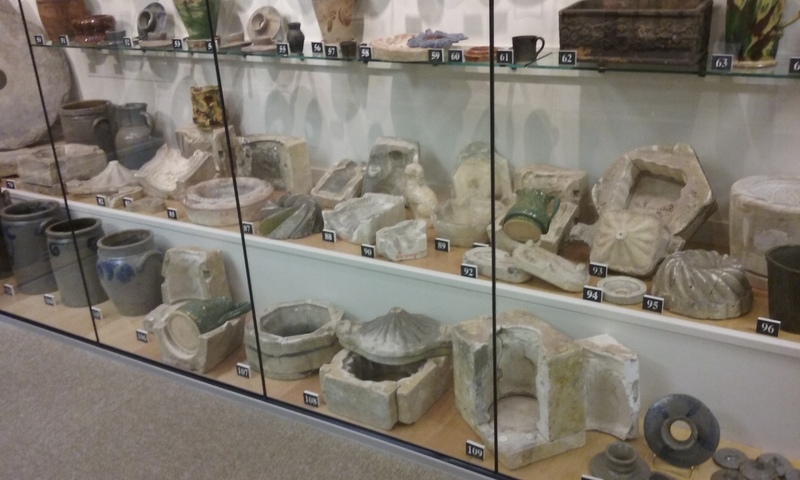 Several displays of old pottery and the famous Bell pottery are also displayed here. Check out the Renfrew museum website at http://www.renfrewmuseum.org. The photography and videos are well done and gives you a great perspective of this day in the park, walking through history. A completely separate entity of Renfrew is the very fascinating Renfrew Institute for Cultural and Environmental Studies. 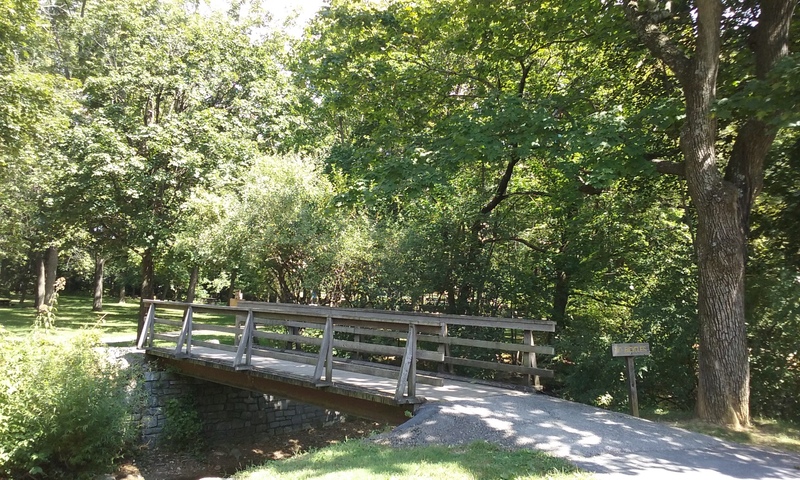 This portion of Renfrew brings over 8,000 students a year to the park to learn past cultures of daily living. 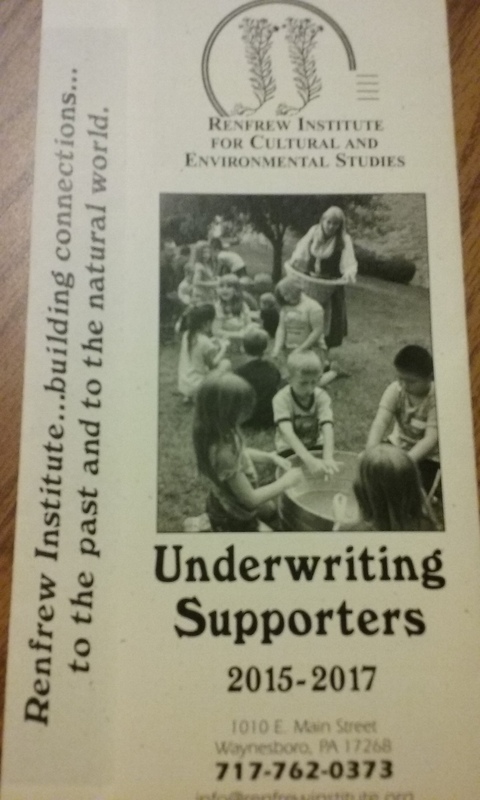 My friend Pam, pictured below on a brochure, dresses in a Pennsylvania German costume made from linen. Among other things she teaches students how to make linen from the flax plant. They do everything from breaking up the tall stalk to remove the outer shell, to weaving the finished threads on a loom. They also plant and harvest a PA German Four Square Garden which is divided into 4 sections with a representation of God in the center and the outer sections representing parts of creation. The produce is donated to a local food bank. All of this educates children in living history and helps them understand how and from where our products like food and clothing come from. Please check out their website http://www.renfrewinstitute.org for fun information. 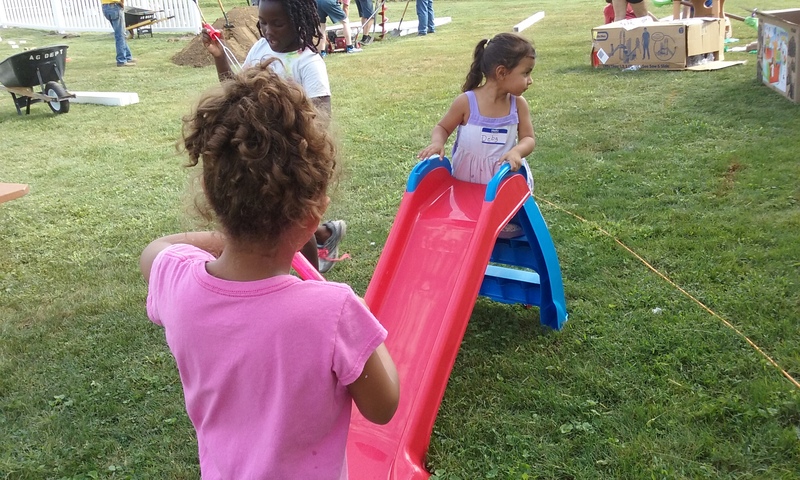 Offering programs like “Once upon a farm” the “grass to milk” process and the significance of the “Four Square Garden,” gives participants the opportunity to touch history. They can see the reality of the hard work and perseverance for survival our ancestors experienced. Can you guess what “Raising Clothing” is, and what about “Growing Clothing?” I love the titles for these programs. The serenity and beauty of Refrew can help us see with grateful eyes how far we have come, and to what heights of ease we have aspired. It is good to recall the work ethic and values these hardships afforded, may we never lose them completely. I hope you enjoyed this overview of Renfrew and I really would recommend a visit to this lovely park. I am told the house is decorated beautifully for Christmas. Make plans to visit it or the websites soon.